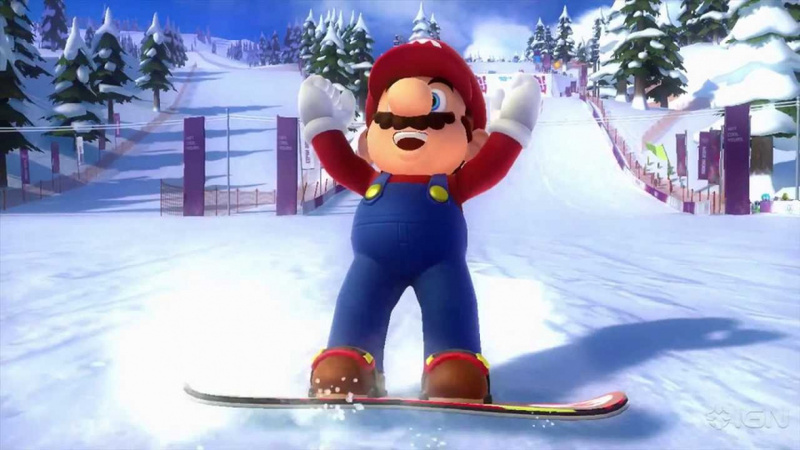 Despite previous entries gracing both Nintendo's home consoles and handhelds, Mario & Sonic at the Sochi 2014 Olympic Winter Games is a Wii U exclusive ahead of the real event next year. Arriving in Europe on 8th November and North American on 15th November, it'll incorporate GamePad and Wii Remote / Nunchuk controls for a variety of sports, some portrayed relatively accurately and others given some unconventional twists. We know that local multiplayer is always an important part of these games, but Satoru Iwata took the opportunity in today's Nintendo Direct broadcast to outline four specific events that will be playable online, with worldwide multiplayer promised — rather than being restricted by region. The four events are Freestyle Ski Cross, Snowboard Cross, Short Track Speed Skating 1000m and Winter Sports Champion Race. The final in that list combines multiple disciplines and mixes up the gameplay to, in the words of Iwata-san, deliver an "outrageous event". Playing against friends is an option, but playing and winning medals against players around the world adds to the points for your country, meaning you can contribute to some Wii U national pride while you're at it. Are you tempted to pick this one up in the Winter, and will you hit the slopes online? All I gotta say is this... I REALLY hope ALOTTA people buy this game. ABOUT, TIME! It might only be 4 events, but its a start! I actually really enjoyed the Wii Sonic and Mario at the London 2012 Olympic Games, so I'm actually looking forward to this one. It's a nice game to play for 30-60mins after a long RPG or Adventure game grind or something of the likes. Worldwide Online play FTW!!! I hope the mechanics of the online games are tight as i'm really looking forward to them now, especially the champion race. Wii Fit U and Wii Sports Club coming out before this. This is being sent out to die. London Olympic Games was dire, but this actually looks quite promising. Hopefully when the Rio game drops, every event will be online. Even if it's only 4 events it's still good to see online. I don't have any use for these types of amateur sports games but I've been interested in this one from the start as the "dream" events look really good. My kids and I have played a lot of Mario Sports mix, and I have no use for hockey or volleyball or basketball or dodge ball, so if that can be good, this can be better. Really too bad about no balance board though, the Shawn White snowboarding game on Wii was really fun, and I have no use for snowboarding either. Don't know when we'll get this - still figuring out the game plan for day 1 and Christmas presents - but I'm still looking forward to it. And no point waiting on a price drop, I think the 2008 Wii version is still $50. Though I always need a game for a B1G1 free sale. It's a start, at least. Next game, everything should be able to go online! Or at least the majority of the events. Certainly getting this one now though! Sorry Mario Party: Island Tour. Oh yeah... I did have this pre ordered for my collection, but now I'm actually interested in competing online! Definitely getting that turquoise Wiimote bundle. This will be another one on my preorder list. Looks like it will be great fun and I love how it's going to keep track of countries and teams. Definitely piqued my interest in the game when he showed off the online multiplayer Very interesting that I'll be gaining points towards my country's total, can't wait! The playing online to win medals for your country bit sounds cool. I didn't realize that it was Wii U exclusive either, so if that results in a better quality game I might have to pick it up. This new online mode moved this game on to my list of wants. The problem is there is just to many titles and not enough money. I actually do not mind that DKR was pushed to February. Why couldn't they have had hockey?! I'd even pay extra for it as DLC. i love the chance to show off whenever i get the chance, but this game also gives me a side benefit of giving my country points for it? that is such a sweet temptation. i just hope enough people get the game for it to matter. I thought hockey was shown on the initial trailer as one of the "dream events". Is this going to have full country listings like the olympics or only Nintendo placed countries etc? I feel they should have made it compatible with the Balance Board like the previous entry that I still have. Hope you can use the pro controller, I really don't like using wii remotes on my wii u. This game should be for 5 players! Wasn't even interested until I heard about online in the Direct. Now I'm probably going to pick this up. I hope we are given the option to earn points for a region independent community (Global, Worldwide, Other, etc), like Wii Sports Club does. Most people like their country and its OK, but I don't have special bonds with any country in particular.